Flood insurance in Canada is in a state of flux. The Calgary flood of 2013 changed everything. And, now, increased severe weather events across the country continue to shape the private flood insurance landscape. At the National Insurance Conference of Canada, held in Quebec City this week, a panel of industry experts sat down to discuss the state of the flood insurance market. Here are some highlights of that discussion. IBC consultant and former TD Insurance CEO, Alain Thibault, said the Canadian private flood market has come on in leaps and bounds. But there are still glaring gaps in the coverage offered, he said. “Five years ago, interest in this subject was fairly low … there was [practically] no overland flood in the country,” he said. “The risk was not well understood by the industry. It was thought of as uninsurable – it was the Government’s problem. 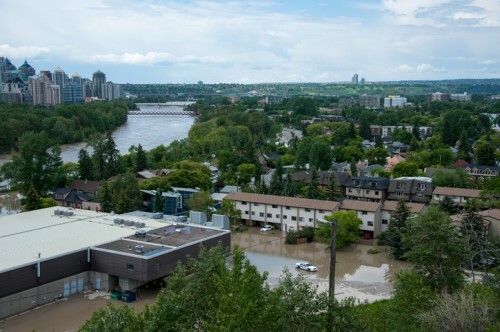 “But the flood in Calgary showed that we are involved … We’ve seen, in the last couple of years, the launch of flood products around the country. [At IBC] we believe there’s a role for Government and a role for the industry … that are mutually exclusive. President of Direct-Line Insurance brokerage and past-president of the Insurance Brokers Association of Alberta, Gord Enders, said more work was still needed to encourage uptake of the products. The job for brokers has been made difficult by carriers all offering vastly different products, with differing pricing and flood zoning, Enders said. Another potential problem he identified was the point at which insurance would take over as the default protection, and when and how Government relief funds would cease being a “back stop”. IBC vice president of federal affairs, Craig Stewart, said discussions between the IBC and Government continued, but more stakeholders needed to begin having a seat at the table. Mortgage lenders and realtors needed to be better informed and have a voice in the discussions, he said. “Where to from here?” he asked. “The industry-Government discussions are going well … [but] our products need to mature. Could Montreal face floods soon?